The previous post consisted of the first three videos of a seven-part series on the bench press. Here are the final four videos. It’s pretty detailed stuff that you might find quite useful. 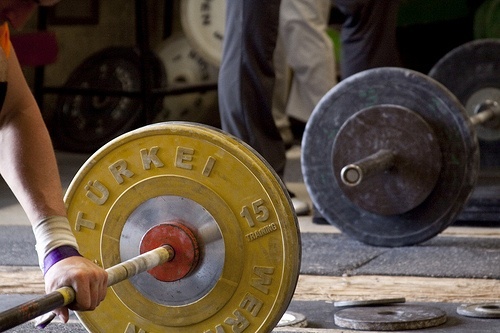 It all comes from the powerlifters at EliteFTS. The bench press is a total body lift, not just an upper body lift. Keep the shoulder blades pinched back and pressed into the bench. Keep a tight arch in the low back. Keep the legs and glutes tight while pressing the feet firmly into the ground. Hold the breath during the upward push. Think of pulling the bar apart, or think of pulling the wrists apart. Keep the entire body tight and tense the whole time you’re under the bar. Don’t relax. Recently I posted an instructional series on the squat (here, and here). It came from the very knowledgeable and very strong lads at EliteFTS.com. The next in this series called So You Think You Can Bench. It’s a seven-part series. I’m posting the first three here. You may not be a powerlifter looking for a massive bench press but much of the discussion is very useful. The bench press is a total body lift, not just an upper body lift. The whole body should be tight: legs, glutes and abs included. There should be a tight arch in the low back. (Dave Tate suggests in this video that you should actually be quite uncomfortable while you benching due to this excessively arched posture. I’m not sure we should spend much if any of our time being terribly uncomfortable. But the overall idea of tightness and tension is spot on.) The shoulder blades should be pulled back and pressed tightly into the bench. You should think of pulling the bar apart sort of like pulling apart a piece of chewing gum. Watch and learn. New Personal Record on the Deadlift: 425 lbs. 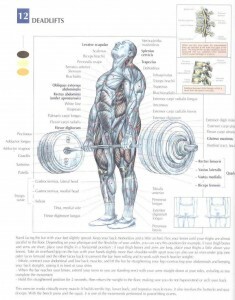 I’m a big fan of the deadlift. For some reason I’m fascinated by plucking very heavy objects off of the earth. I my goal is 500 lbs. I’m hoping to hit it in the not-too-distant future. My prior PR on the deadlift was 420 lbs. Today, despite dealing with the remnants of a cold, I pulled 425 lbs. — AND THAT MAKES ME HAPPY! It’s a good way to start the weekend. That’s it. Nothing of much importance to add. My newly (re) discovered enthusiasm for barbell lifting has led me to start a new class at the gym called Basic Barbell Training. As the name suggests it’s a class based around traditional, tried-and-true barbell lifts: squats, presses, the deadlift, the clean and variations of these lifts. Getting stronger is the goal. To start the process, I’m holding several free seminars in order to generate interest in small group barbell training at the Cherry Creek Athletic Club where I work. Ideally I’d like groups of no more than three people. The class would meet two or three times per week, depending on how often people can attend. We’ll progress from simply learning the lifts, to upping our poundage and getting stronger, to developing power. This type of general strength and power development will benefit anyone from endurance athletes to golfers to anyone looking to improve daily physical function. Seminar content will include footwear, posture, breathing and tension. We’ll cover two basic exercises in the seminar, the goblet squat and the overhead press. Both are bare-bones exercises that require minimal equipment. No racks or benches required. Though the air/goblet squat doesn’t involve a barbell, it is an essential movement in learning how to squat and deadlift. The overhead press is a fantastic total-body exercise that translates to real life. Though only the arms are moving, the entire body must work at stability and balance. Both members and non-members may attend. For more information, please contact me at DenverFitnessJournal@Gmail.com or by calling 720.587.7038.